You know when you wake up from a bad dream and, even though nothing is actually wrong, you feel like something horrible is going to happen? Or that something bad happened and you’re just quietly waiting to find out about it? I’ve had TWO of those this week. Normally, I don’t remember my dreams. I used to, but anymore I think I’m just so tired at the end of the day that my brain is like, “Pillow!? I’m DONE.” You can imagine my dismay, then, when I found myself waking up twice this week with that something-horrible-has-happened feeling. The first one was the worst. Like, the WORST. 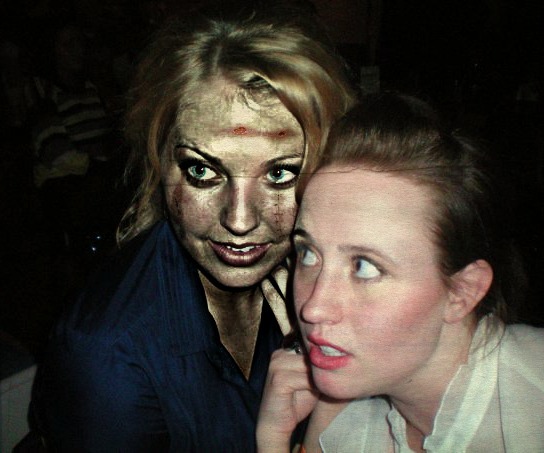 I haven’t talked before on here about my zombie problem. I just simply can’t handle them. I could watch vampire movies all day long (even real vampires, not sparkly vampires), but I couldn’t even get through Zombieland. In college, when I was stronger and braver, I watched Shaun of the Dead. Even with the humor, I hated (insert hipster protests of “it’s brilliant!” and “such clever humor!”) every second of that movie. No amount of British wit could take my mind off the flesh-eating. The problem is that it’s so widespread. Other horror movies are generally an isolated incident, but Zombie movies promise the death and destruction of everything I hold dear. I just can’t handle it. So yeah, obviously, it was a zombie dream. It started out with my friend Ashley (who is totally responsible for this dream, as she was talking about The Walking Dead on Facebook.) and I hearing about the zombies on the news. I, of course, flip out and immediately start trying to find a way to get to Paul and Charlie. Ashley is worried about her Grandma, and explained that her Grandma has a shotgun, so it would be smarter for us to get to her Grandma first. So, on the way to her Grandma’s house, Ashley gets touched (did I mention it spreads by touching? Even my subconscious can’t handle the flesh-eating) and is out for the count. So, I find her Grandma (and her shotgun), and then I find Paul and Charlie. I cannot explain to you how exponentially worse a zombie dream is when you add in a toddler. I am, in fact, getting a little choked up just typing about it. As we’re escaping the mass of zombies, Paul gets touched by one of them. Now, the zombieness doesn’t happen immediately, so we managed to elude the big group long enough to have a heart-wrenching goodbye. . . complete with the move where we clutch fingers as we part and they slowly slide off of each other as I leave with Charlie and Paul begins convulsing and turning into a zombie. I don’t even remember what happened after that. Hopefully I woke up. Ugh. I can’t believe I just sat here typing about zombies with tears in my eyes . . . you’d think I was writing some profound blog post about the injustice of child slavery. Finally, and I’ll make this one quick, I just had a dream last night about ALMOST being unfaithful to Paul with the guy who plays Fowler on White Collar. Seriously? Yuck. Yeah. I decided about halfway through the shenanigans that it wasn’t worth it, and as I was clearing all of my stuff out of his dorm room (really, what?) and explaining why I had to leave, I saw some Reese’s Pieces on his desk and nervously threw a handful in my mouth. Note: I gave up chocolate for Lent. So, as my brain was screaming “Nooooooooooooo!” but my mouth was screaming “Yeeeeeeeesssssssssssss!” I scramble out of the room, chewing frantically and tripping on random guy stuff. I then, of course, wake up feeling like a dirty, horrible lady. I’m sure there are some dream analyzers out there thinking I’ve got some marital problems, but I’m pretty sure it’s actually because I watched the entire second season of White Collarentirely too quickly AND zombies are just the worst.